For me, kale is a tough cookie. Well, it's a tough green, but you know what I mean. It's a vegetable that took me a long time to warm up to, and one I'm still unsure of today. It's a texture thing for me. I do love my greens, but I don't particularly enjoy the sensation of nomming on green paper. In my book, kale is an ingredient, and not a straight-up food. It can either make a recipe a success or a disaster depending on how well it's treated. I've had one too many salads in which the kale was either too crunchy, too stringy, or just too papery, and if you dare sauté this leaf, then you'd best be prepared to stop cooking it the minute it gets soft and not a minute later. Over-cooked kale might taste worse to me as a grown adult than steamed spinach tasted to me as a five-year-old. Yuck. So that's my warning. And here's my recipe. This might be one of the best salads I've made, and it's certainly my favorite use of kale I've come across. The trick is to rub the kale with oil to help it wilt a little, and to not be afraid to let it sit in the fridge a day or so to let the dressing wilt it just a little more. The kale combined with the sweetness of the roasted squash and the creaminess of the dressing is pretty fantastic, and the zing from the vinegar and spices push it to the top. I love making this recipe, despite my lack of owning a knife capable of properly peeling a squash, and I will continue to make it again and again. Feel free to donate any kale (or a knife) to the cause. I might even share with you. Preheat oven to 425 degrees. Line a baking sheet with parchment paper. In a large bowl, toss butternut squash with 1 tablespoon of olive oil, salt and pepper. Transfer to baking sheet and roast about 30 minutes, stirring halfway through cooking time. While squash is baking, place kale in large bowl. Drizzle with one tablespoon of olive oil and season with salt and pepper. Using your hands, massage kale leaves until it softens and wilts, about 3-5 minutes. (Kale will taste mild when it's done.) Set aside. Whisk together tahini, water, lemon juice, and remaining tablespoon of olive oil. Add salt and pepper to taste. 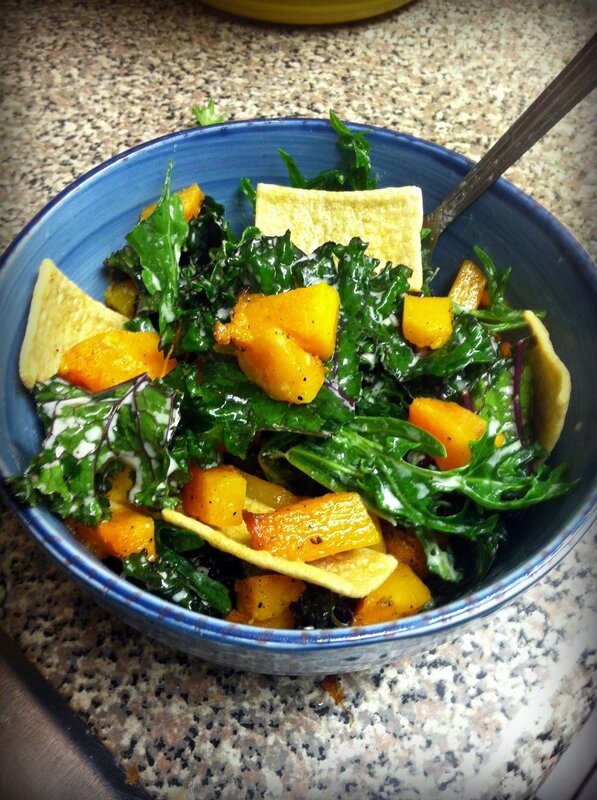 Divide kale, butternut squash, and pita chips into servings bowls or plates and serve with tahini dressing.